When looking at pictures of the photographs of the Talpiot Tomb B ossuaries, I found a number of anomalies. I wrote these up in the form of questions in a post headed Anomalies in the Talpiot Tomb B Photographs. The difficulty with that post is that it was over-technical, over-detailed and un-illustrated. 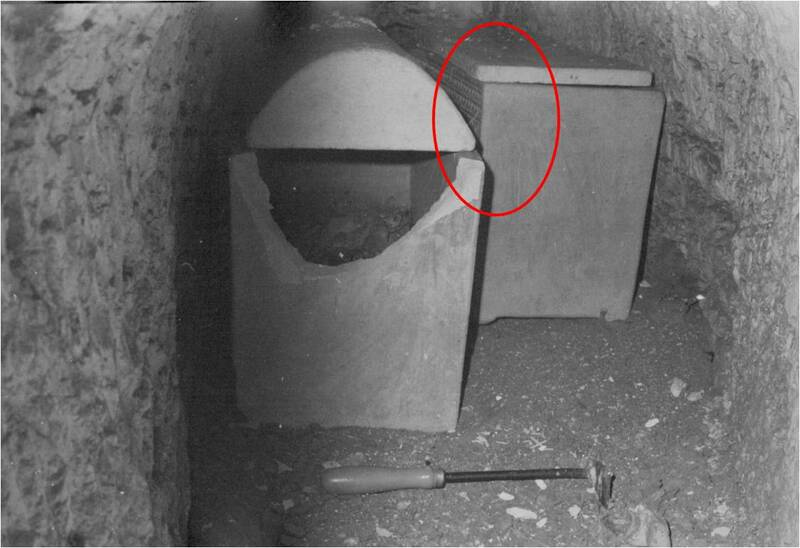 So I decided to focus on just one of the issues, the question of the identity of ossuary 5, and was able to demonstrate successfully that the photograph below, found in Tabor's Preliminary Report, p. 37, fig. 7, was actually of ossuary 4 (now corrected in that report, though without acknowledgement). I would now like to move on to a related issue, the question of the correlation between these 2011 photographs and the 1981 photographs from the initial Amos Kloner investigation. Inside Ossuary 4, kokh 2, 2011, Preliminary Report, p. 32, fig. 7, annotated to draw attention to the crack at the back of the ossuary. This ossuary is in its original position. It is ornamented but due to its distance in the niche and its closeness to the wall we were not able to examine its façade closely. Its far end has a name inscribed in Greek but unfortunately even our snake camera probe could not reach far enough inside the niche to shoot back at that end and get a clear wide shot of the letters. All we have is the 1981 enhanced photo in which the Greek letters are faintly visible but remain undeciphered. There are two possibilities here. It could be that the crack was caused in 1981, but this seems unlikely given that only "scratches" are mentioned (Preliminary Report, 5) and not major damage. It seems more likely that we are not looking at the same ossuary. In summary, there are conflicts between ossuary 4 as it is apparently represented in the picture from 1981 and as it is represented in the recent investigations. In one it has a big crack and in the other it does not. And while it is described as "plain" in one place, it is described as "ornamented" in another. I am grateful also to David Meadows for useful discussion of the issues here -- see his Pinterest page on this topic.